Last week Nepal celebrated its biggest annual festival, Dashain. I heard from Mutsumi that she attended a Dashain party organized by Nepalis in Fukuoka. Me, I visited my Nepali family for a blessing and a tika. After that a few of us from art school met in Bhaktapur, where Jiwan hosted us for for evening. This picture was taken at a small shop like a convenience store, this one selling ice cream. From left to right we have an American, Tibetan, Japanese, Bhutanese, and Nepali. Quite an assortment, eh? 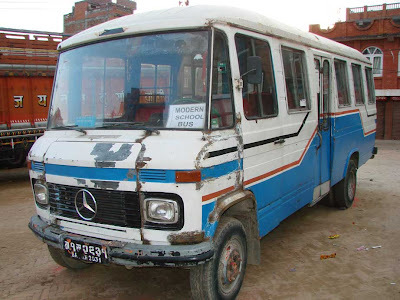 While in Bhaktapur we ran across this bus, which I can only imagine belongs to The Modern School.